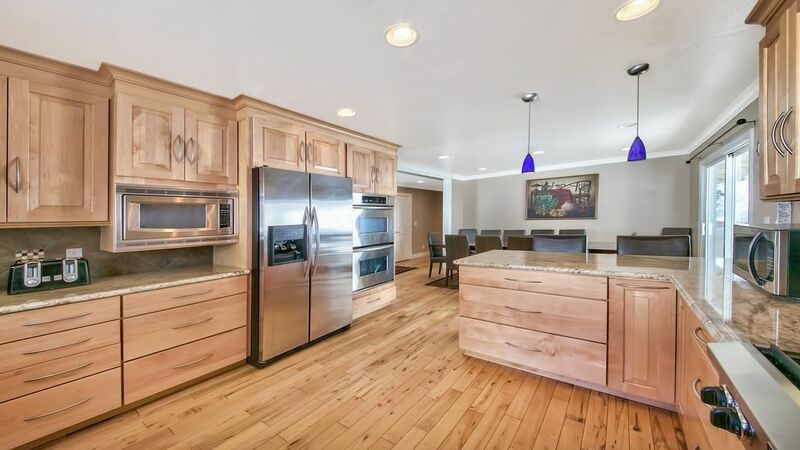 9 bedroom, 5 full bath, sleeps 22, private contemporary two level Mountain home, located on 1/4th of an acre in the Heavenly Valley area of South Lake Tahoe, NV. With almost 3000 sq feet, this home is perfect for large groups. Bedding includes 2 king beds, 6 queen beds, 2 double beds, 3 twin beds. Six bedrooms are private, with two bedrooms have a king and the other four a queen, the other three bedrooms have multiple beds. After a day of fun in the snow or on the beach, enjoy a secluded evening with friends and family while soaking in the large outdoor hot tub, grilling on the gas BBQ, playing pool, watching the flames in the gas fireplace, or your favorite TV show on one of the7 TV's, or staying connected with free wireless DSL. Known as Chef Dave's Lodge because of the fantastic kitchen, that includes a 6 burner gas cook top, double ovens, microwave, dishwasher and a large refrigerator. This home also has full size washer and dryer in the laundry room, double car garage, with parking for an additional 6 cars, or RV in the driveway. Beautiful maple hardwood floors through out, showers in all five bathrooms, with 2 of the bathrooms also having a tub. Just a short downhill walk to Heavenly Valley Ski Resort's Boulder ski lift, or hop on the shuttle to Heavenly. 4 mile drive to the downtown casinos, shopping, beaches and restaurants. Pets are welcome with owner's approval. Non-Smoking please. I am a chef instructor at a culinary school in the San Francisco Bay Area, my passion is cooking and skiing! We also like to entertain and cook for large groups sometimes as many as 27 We have two large dogs and take them with us, they love Tahoe! We are just a short 3 hour drive from our home in the Bay Area to our home in Tahoe. We appreciate the privacy of being on almost 1/4th of an acre. We can invite a lot of friends, and have celebrated family reunions, birthdays, and retirement parties. The quiet, the conveniece of Heavenly's shuttle stopping to pick us up at the driveway and dropping us off after skiing, close enough to shopping and the casino area, yet far enough to feel that you are truly in the mountains. Our group of 22 enjoyed our time. It was a clean and comfortable place to stay. Great location to and from Heavenly Resort. Hosts were very accommodating. Would highly recommend. We absolutely loved this house for a ski trip of 13 adults. We had plenty of room for everyone. The location is walking distance to the Boulder lift but we did have to drive over to the Heavenly gondola for those who were in ski school. The kitchen had all the tools we needed for cooking for a large group. Overall would definitely recommend this spot! It had plenty bedrooms and was laid out nicely. The kitchen was adequately stocked with everything we needed as we cooked dinner most nights. The location was in a great spot for us...not far from the other Heavenly lifts and one at the bottom of the hill (too far to walk though, but plenty of parking available). The pool table and hot tub were nice additions that we all enjoyed. Perfect location for skiers, big & roomy. Great space for a big gathering, with chef-grade kitchen. We made multiple meals, and loved our stay. Short walk to ski lift. With 20+ people, this place gets a little loud, but that's half the fun, right? Fantastic house and amazing owners! My family have been coming to Tahoe annually for President’s weekend for many years. As our family has grown it’s been difficult to find a house to accommodate us all. So we were thrilled when we found Chef Dave’s Lodge. This President’s weekend we experienced the worst traffic we’ve EVER been in. A drive that should have taken 2 1/2 hours took our family between 12 and 21 hours. We were exhausted when we arrived. During the drive we reached out to the Tahoe Mgmt staff and received quick and thoughtful responses from Tahoe Mgmt AND the owner. They were quick to respond, kind and helpful. The house itself is fantastic. It’s big but also welcoming and comfortable. We spent a lot of time cooking and having family meals in the wonderful kitchen. We watched movies and played pool in the family room. We were able to be together but still have the respite of a private room when needed. The hot tub was well used and appreciated. We got lots of snow too and were able to build ramps for the kids to slide on. The location was great, especially for anyone wanting to ski/board at Heavenly. Just a one block walk to the Nevada entrance. There is also a little market (well stocked) and a burger/pizza place called Fox and Hound just 1/10th of a mile from the house. We had a fantastic vacation and hope to visit Chef Dave’s Lodge again. Great house, fantastic staff at Tahoe Mgmt and an amazing owner. Thank you, Evie! You were generous beyond expectation. We’ll be in touch! Great place to stay. There were 16 of us that stayed comfortably. The kitchen had everything we needed and there were plenty of towels for everyone. The kids enjoyed sledding right next to the house. My husband loved how close he was to ski left. Everyone had a great time. Thank you Dianna, so happy you enjoyed our home!